What a difference ten years makes. 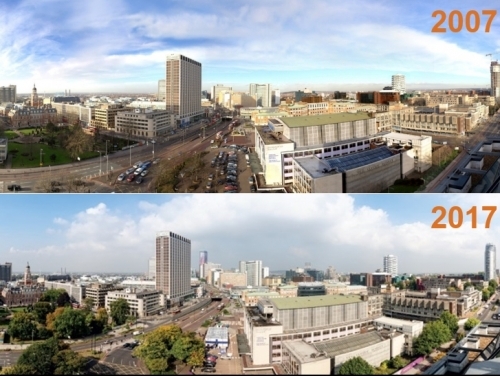 These photos taken a decade apart demonstrate the breath-taking pace of change across Croydon. The first was taken in 2007, when Stiles Harold Williams (SHW) moved to its new South London HQ on the 7th floor of 69 Park Lane. Croydon Council’s former home, Taberner House, is still standing in the foreground but is now replacedby Bernard Weatherill House. In the background, Saffron Square’s distinctive colours are distinctly absent. Richard Plant, Develop Croydon chairman and SHW’s Head of South London, Surrey and Kent, said: “We’ve said goodbye to Taberner House and hello to Bernard Weatherill House and Saffron Square gaining prominence on the skyline. In good weather, The Shard is now clearly visible, demonstrating ourproximity to London yet retaining our own distinct character and identity. Even since October 2017, when the second photo was taken, three of the skyline’s biggest edifices havebeen covered in scaffolding and cranes, all ready for residential conversion. Carolyn House will comprise 16 stories including 183 apartments and retail space. Leon House willshortly be remade into 263 smart-living units, and Impact House will provide another 235 apartments complete with doctor’s surgery, gym and other building-as-community facilities. Plans have been submitted for Tide Construction’s 546-home development in George Street. The 44-storey modular tower will be largest of its kind in the world. Add to this the 514 units envisioned by Hub on the old Taberner site and that’s 1,741 exciting new places under construction for people to live, work and build their lives in. In addition, Chinese investor R&F have started the pre-app process on Queens Square: 288 residential units on the former Nestlé offices and around 800 units at St George’s Walk. Croydon is also set to see its cultural and lifestyle offer expand considerably with the influx of new residents. The Croydon Partnership’s retail-led leisure scheme at the Whitgift Centre will create a UK top-10 shopping and entertainment destination and deliver 7,000 jobs and 1,000 homes. The regeneration of the Fairfield arts and entertainment centre, to create a world-class venue at the heart of the town centre, is well under way. Guildhouse Rosepride has secured planning permission for the UK’s second tallest building, One Lansdowne. Two towers of 68 and 41 storeys, linked by an 11-storey podium structure, will contain 794 residential units, office space, retail, a swimming pool and gym, a bar, restaurant and publicviewing gallery. The vision for the Croydon panorama of 2027 is certainly an exciting prospect.